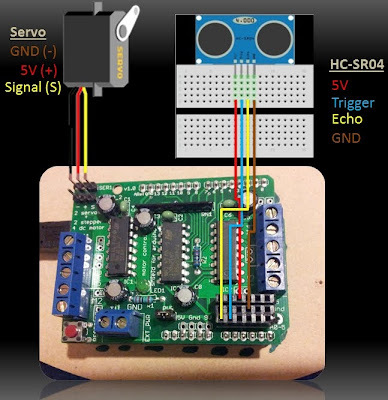 This project utilises the HC-SR04 ultrasonic sensor is to scan for nearby objects. You can program the Arduino to sound an alarm when the sensor detects an object within a specific vicinity. 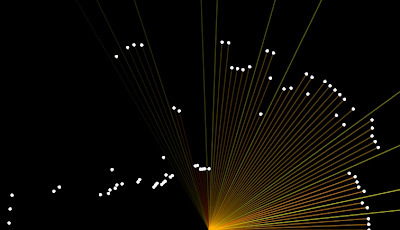 Connecting it to a computer allows data to be plotted to make a simple sonar scanner. The scanning ability is made possible through the use of a hobby servo motor SG-5010, and an Adafruit motor shield v1.0. MDF Standard panel (3mm width) - for the top and base of the gauge, and the pointer. Velcro dots - to allow temporary application of the mini-breadboard to the gauge. The Servo motor can be connected to either of the Servo motor pins (Digital 9 or 10). In this case, the Servo is attached to digital pin 10.Make sure you read the servo motor data sheet and identify the VCC (5V), GND, and Signal connectors. Not all servos have the same colour wires. My servo motor has a white signal wire, a red VCC wire and a black GND wire. Also when connecting your wires to the HC-SR04, pay attention to the front of the sensor. It will identify the pins for you. Make sure you have the sensor facing the correct way. In this sketch, the sensor is actually facing towards you. // Tell the arduino that the servo is attached to Digital pin 10. //Send the angle to the Arduino. The fullstop at the end is necessary.